This is an interesting tunnel tent from Slumberjack. Also comes in a 10 person version. The 8 person version weighs less than 20 lbs. Don't know what the pole material is. There is a video of the tent on the website. There may be issues with being able to close down the ventilation system to prevent drafts. Price is not bad for someone who want to get into Winter camping on the cheap. Also comes with a lifetime warranty. Interesting. I'd be cautious very no extremely reluctant to attempt winter camping in that tent. Any snow load on the tent, IMO/judgement, would wreak havoc onto the inhabitants. 9mm FG wands on a tent this big? Actually tunnel tents are great for winter IF they have angled vestibules at both ends and strong poles. 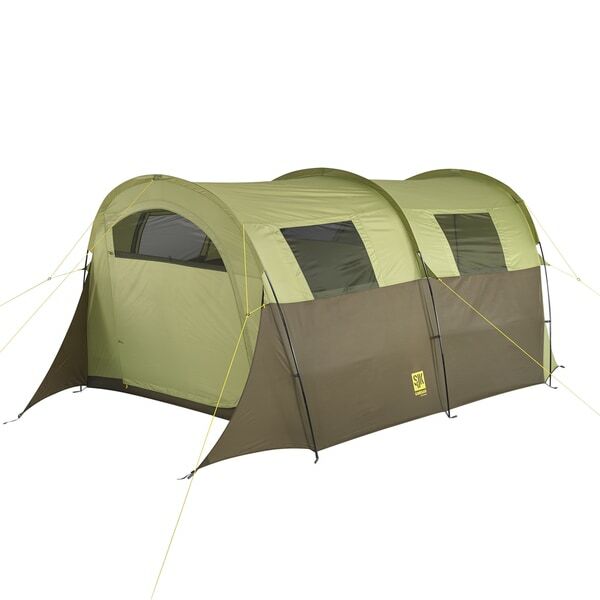 See Hilleberg's tunnel tents. ""Actually tunnel tents are great for winter IF they have angled vestibules at both ends and strong poles. See Hilleberg's tunnel tents. I totally agree, but getting one tall enough to stand up in with selling my soul to the Devel or my grandchildren into servitude is the problem. Hilleberg use 16mm alloy poles on their big tunnel and I can't afford it.